What exactly does one think of when they hear the word ‘biker’? A tall, hairy, well built, perhaps ever so slightly overweight, leather wearing male? I think most of us do, at least those of us who have never been exposed to the world of motorbikes; it is after all the image that most films and the media portray to us. However, that’s not to say that all men ride Harley Davidson’s, that all bikers are as good looking as George Clooney, or even that all bikers are men. Nevertheless, I cemented my decision to change the definition of ‘biker’, to one where I was included, whilst acting as pillion on Iñigo’s R1200GS, during a ride out. The way these men dominated the road, sped by like a flash of lighting, controlled every bend in the road, but most importantly did so with utter joy on their faces, left me wanting more – the mere two-hour trip was simply no longer satisfactory. I wanted control of the bike. I wanted the independence. I wanted the fun of the chase; a fun which is only wholly achieved and felt by the regulator of the wheels. Considering the thrill I was receiving just hanging on behind, I craved and could only imagine the power and burst of energy that I would receive if I was orchestrating the bikes direction, manipulating the ride as I wanted. The solution was rather simple: I got my CBT. Covered up in bed and hidden by the duvet, I secretly began to search places to do my CBT from my parents, but mostly Iñigo. 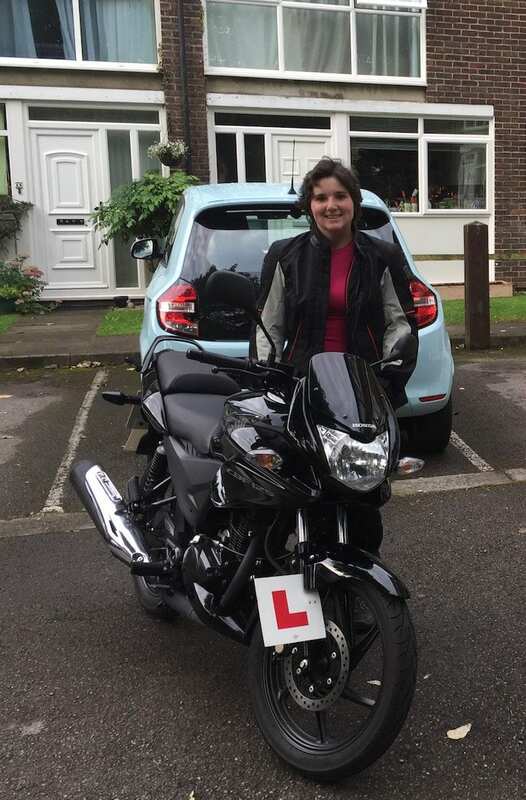 I had two thoughts running through my mind, first, I wanted this to be a trail to see whether I would enjoy motorbike riding as much as I had enjoyed being a pillion, particularly having been so against the idea just a few months prior. Secondly, I wanted it all to be a surprise from the boy who thinks, dreams and talks bikes all day. I could only imagine his face when I appeared with a CBT; imagine his euphoria when I revealed my desire to ride bikes. Just the thought of how happy he would be, bought elation to me as I impulsively booked myself in for the day. I rolled up in my little red car and parked. Dressed in my horse riding waterproof, black skinny jeans and Gore-tex walking boots, my mismatched outfit reflected the weather perfectly. Into a shed we were stuffed and soon our lesson began. The gentleman began to explain all the essentials, from legal helmets, to the controls. Intently I listened, determined to learn all the necessary information to do well and pass the test. Always one to please and, let’s face it, a massive nerd, I wanted to get the top grades and do well. As the rain chundered down, it was time to get on the bikes. Suddenly, I was ever so slightly nervous at the thought. Everything had led up to this moment, but now the vehicle began to look slightly intimidating. Was this man really trusting and letting me ride this thing by myself? Was I really going to be in control of a motorised machine? It seemed like a lot of responsibility to me. What if I lost control and hit a car? I mounted. My instructor explained how to get into first gear, where the clutch was, the throttle and most importantly, the brakes. He instructed me to ride forward slowly and stop after a metre. Talking myself through the process I began… Clutch in. Foot down into first. Release the clutch slowly. OH, OH MY GOODNESS! I WAS MOVING! I DID NOT STALL! And stop. AGAIN! I wanted to do it again! And off I went, metre at a time, around the pad. After a lap, he announced that I could go off around the pad by myself. FREEDOM. Off I set, moving slowly around the pad, gathering speed each time, before I got bored and began to incorporate changes of direction, cone work and even second gear. Forget Iñigo and how happy he would be if I go my CBT, this was bloody fun! I was having the time of my life. Twist, turn; stop, start; right, left; figures of eight – this was AMAZING! I was gliding around. I would even say I was half good at it. Before we headed onto the roads my instructor turned to me and said “it is obvious to me you are going to enjoy this, you have not stopped smiling all day”. Roads. Roads are BRILLIANT. Far better than slow riding pads. On roads, you can hit 30mph! I could not have imagined anything better! Off I zoomed, immediately being told to slow down through the radio, practicing junctions and bends. It was phenomenal fun. I got it, I completely got it now (in hindsight, having ridden a BMW G650GS on my A2 course, I did not get it then, the feeling 650cc gives in comparison is shameful). This is why people ride motorbikes, screw being pillion, this was far better. I felt empowered and the rush that was ignited as a pillion was now exploding like a firework within me. The course had finished. As I rushed back to my car, certificate in hand, I received a message from Iñigo saying something along the lines of “you have not spoken much today, been riding all day?” I simply replied “I kind of riding” with a photo of my CBT.